What are Oil Lamp Chimneys? 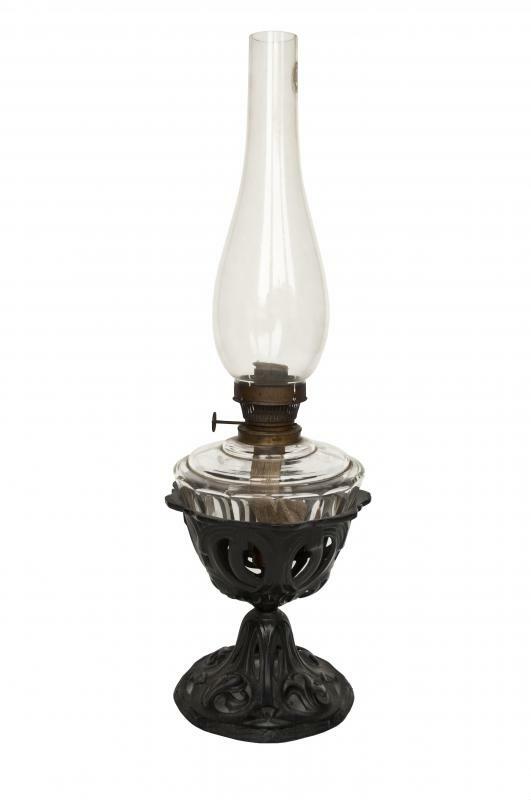 An oil lamp used to be a staple in many homes, providing steady, relatively bright light. Oil lamps in modern times are often used as decorative accents and as emergency lighting. Oil lamp chimneys are the glass cylinders that fit over the wick of an oil lamp, allowing the flame to burn brighter and protecting it from drafts. Oil lamps began as stone or pottery bowls that were used to hold fat or oil. Wicks placed in the oil burn in much the same manner as candles, drawing on the oil in the basin for fuel. Such lamps were useful for bringing light into dwellings that had been dark before, but they also had some serious drawbacks. The worst problems with bowl or basin oil lamps were that these lamps had a very smoky flame and the wick did not burn brightly. Part of the problem was that the wick used was round and did not burn in the center, resulting in excess smoke and a dim flame. The flame was also quite susceptible to drafts, because there were no oil lamp chimneys at the time. Often the flame would go out when someone walked by too closely, a door opened, or when anything else caused a puff of air to reach the lamp. Late in the 18th century, people began to use flat wicks. These burned much better than the old, round wicks, producing far less smoke, but the light emitted was still quite dim. Drafts also continued to be a problem. Not long after flat wicks came into use, chemist Aimé Argand of Switzerland invented a new kind of wick. This wick was round, but it was hollow in the center and burned much brighter than either the flat wicks or the solid round ones. At the same time he created the hollow wick, Aimé Argand introduced the use of oil lamp chimneys. These oil lamp chimneys serve multiple purposes. They protect the flame from drafts and help to channel oxygen to the flame, allowing the lamp to burn even brighter. Modern oil lamps are made of many different materials, most often glass. Their chimneys come in a variety of decorative shapes, often with etchings or other decorations. In some parts of the world, these lamps still serve the very basic purpose of providing the main source of light for homes without electricity. In other places, the lamps add to the overall ambiance, often burning scented oils and adding fragrance as well as light to a home. How do I Identify a Victorian Oil Lamp? What are the Different Types of Oil Lamp Shades? What Are Olive Oil Lamps? How do I Choose the Best Antique Oil Lamps?